The What: Martin Audio has released nine new products, including the ADORN series of loudspeakers, the SX110 subwoofer, a range VIA amplifiers, and Ethernet to U-NET bridge U-Hub. The What Else: ADORN loudspeakers are designed for distributed sound applications that require high performance from visually discreet, ultra-compact enclosures. They provide a sonic transition within a multi-zoned complex using larger Martin Audio systems such as CDD or BlacklineX.Featuring a 4” and 5.5” driver, respectively, the two-way ADORN 40 and ADORN 55 are available in black or white as standard and can be readily painted to match any interior décor and architectural environment. The new SX110 subwoofer will extend the bandwidth of ADORN on-wall speakers and works for foreground music applications, which require increased impact and low frequency performance. Designed to be able to sit under banquette seating or discreetly placed within a venue, its ultra-compact enclosure features a 10” (250mm) driver and generous bass-reflex porting to reduce air noise. SX110 can also be suspended by means of integral M8 threaded inserts. VIA is a new range of four high performance, cost effective power amplifiers designed primarily for installation use, but also suited to portable applications. VIA partners with all Martin Audio loudspeakers where networking and onboard DSP are not required, but where full system set-up is necessary, either the existing DX0.5 controller or newly announced DX4.0 can be added. DX4.0 is a 4-in 8-out loudspeaker processor and matrix featuring networked audio via Dante, high quality 96kHz processing, VX limiting as well as FIR optimization support for O-Line with Scalable Resolution. U-Hub is an Ethernet to U-NET bridge equipped with analog and AES3 digital audio transport. 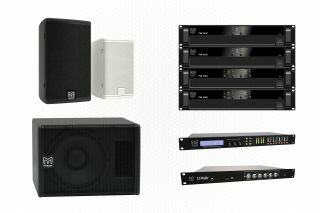 It facilitates PC connection and VU-NET software control of MLA Series arrays and subwoofers via their inbuilt proprietary U-NET network. When used in conjunction with the Martin Audio DX4.0 networked system controller, U-Hub can connect audio and network to an MLA Series system with a single cable via a Dante digital audio network. The Bottom Line: The products will be on display and demonstrated at the company’s UK Open Days, September 18-20, in High Wycombe.